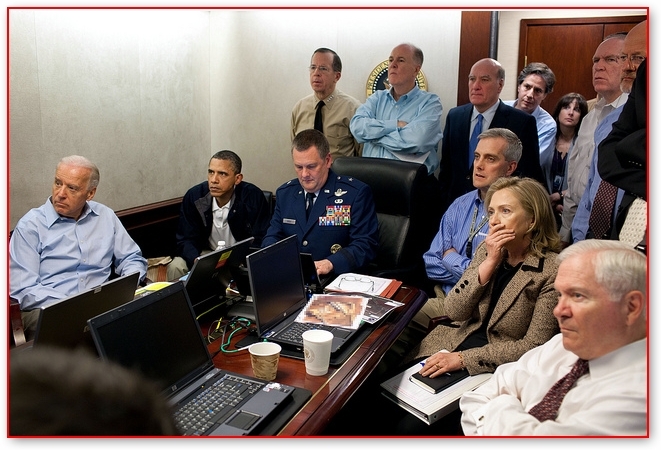 The first time I saw this photo I was not surprised that one of only two women in the situation room was aghast. I understood the emotion she revealed watching Osama bin Laden’s execution on a live feed from the helmet of a U.S. Navy SEAL. For me, it appeared to be “shock and awe,” to borrow a Bush phrase, and also some raw humanistic despair. For what led to this. And what will ultimately follow. But now, we learn from Ms. Clinton, that no, no, no, she was not appearing emotional like some WOMAN, but rather, she was allergic. That’s according to Forbes and a number of other blogs who report she claims she was covering her mouth while coughing. Too mcuh ragweed in the situation room apparently. I found her humanistic reaction to the shooting in the eye of Public Enemy No. 1 to be understandable and not weak or girly, as I gather we are supposed to believe. It was not a sign of weakness, but a sign of her grasp on the severity of the situation and the possible fallout. After all, she has to deal with all the U.S. haters in her line of work. She does, after all, work outside the home, even if she is a woman. I didn’t see her gesture as an aw-she’s-a-woman so she can’t stand a well-deserved hit live and on screen reaction. I kind of liked that she was able to see here was a person, with a gazillion wives and scores of children, some close in age to each other, that the U.S. was taking out. Instead I saw her gesture as an instinctive reaction from a person who thinks ahead. Perhaps she was playing the clock forward and imagining the anti-American sentiments erupting in the Muslim world, the retaliations, the bloodshed we may see on our soil again as a result. I’m a little angry she made it about the need for Claritin. It was perfectly clear to me that she reacted as a clear-thinking, clear-headed, intelligent person, with a heart and soul. For that, she needs not apologize.